Every year, I look forward to the royal family's appearance at the Holmenkollen Ski Jumping championships. The competition won't take place this year, though, because Holmenkollen is hosting the FIS Nordic World Ski Championships from Feb. 23 - Mar. 6. I expect the royal family to show up at the opening ceremonies, but I hope they'll also show up for several of the other events. Prince Haakon is on the Advisory Board of Oslo 2011, the organizing committee for the championships, so at the very least, I imagine he'll be in attendance several times. He appears in Oslo 2011's promotional video, welcoming the world to Norway. Thanks Kenya for posting the video, I love listening to Crown Prince Haakon speak,especially english. I also hope the royal family show up, I love watching the children. Every year, I look forward to the royal family's appearance at the Holmenkollen Ski Jumping championships. The competition won't take place this year, though, because Holmenkollen is hosting the FIS Nordic World Ski Championships from Feb. 23 - Mar. 6. There will also be the championships in ski jumping that will take place at the Holmenkollen ski jump. I am pretty sure we'll see the family attending the competition. The ski jumping competitions will take place on February 26th (Men - Individual, Normal hill), February 27th (Men - Team), March 3rd (Men - Individua, Large hill --> usually the Royal attend this competition) and March 4th (Team- Large hill). I can imagine we'll see the Royals (especially King Harald) during quite alot of the competitions. Their Majesties The King and Queen, Their Royal Highnesses The Crown Prince and Crown Princess, and Her Highness Princess Astrid, Mrs Ferner attend the opening ceremony of the FIS Nordic World Ski Championships at Universitetsplassen in Oslo (18:00). The Nordic World Ski Championships: His Majesty The King attends the Cross-Country Individual Sprint free finals. Her Highness Princess Astrid, Mrs Ferner will also be in attendance (15:00). The Nordic World Ski Championships: His Majesty The King attends the ski jumping normal hill, individual ladies. Her Highness Princess Astrid, Mrs Ferner will also be in attendance (15:00). The Nordic World Ski Championships: His Majesty The King attends the combined ski jumping (normal hill, individual men). Her Highness Princess Astrid, Mrs Ferner will also be in attendance (10:00). The Nordic World Ski Championships: His Majesty The King attends the cross-country 15 km pursuit ladies. Her Highness Princess Astrid, Mrs Ferner will also be in attendance (11:30). The Nordic World Ski Championships: His Majesty The King attends the Nordic combined 10 km cross-country. Her Highness Princess Astrid, Mrs Ferner will also be in attendance (11:30). 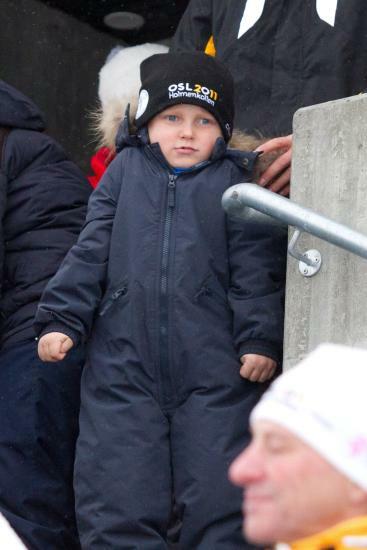 The Nordic World Ski Championships: His Majesty The King attends the ski jumping normal hill, individual men. Her Highness Princess Astrid, Mrs Ferner will also be in attendance (15:00). The Nordic World Ski Championships: His Majesty The King attends the cross-country 30 km pursuit for men. Her Highness Princess Astrid, Mrs Ferner will also be in attendance (12:00). The Nordic World Ski Championships: His Majesty The King attends the ski jumping normal hill, team men. Her Highness Princess Astrid, Mrs Ferner will also be in attendance (15:00). Seems that P Astrid is a follower together with King. First pictures from the opening ceremony today, February 23, 2011. Crown princess Victoria and prince Daniel will be at the championships on the 3th March, king Carl Gustaf and queen Silvia will join them on the 4th and stay until the 6th March. Victoria and Daniel will stay only for two days, 3-4 March. So happy to see the little family again they are so cute ! This is such a funny picture. Contain your excitement, Your Majesty. Wasn't Princess Astrid supposed to be there as well? I didn't see her in any of the photos. LOL. I love this picture of Haakon and Sverre Magnus. LOL ! How a father can be embarrassing sometimes ! I love this pic ! King Harald has been there, too. King Harald hugs the winner of the womens cross country sprint races of the World Ski Championships in Oslo Thursday February 24, 2011, Marit Bjoergen of Norway. Look lovely. I like Sonja's bag very much also. Poor little guy does look cold! I love Sonja's bag, too. I love soft things. Hope Marius will turn up, too, some day!